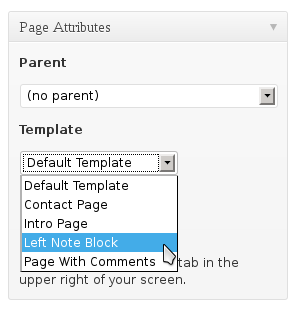 We have added a page template called “Left Note Block” which is set up with a small content area. To create a page like this, add a new page in WordPress and at the right hand side there is a box named Page Attributes. Under Page Template choose Left Note Block. You may need to also set up WordPress to have a static front page, instead of displaying your recent posts. To do this, see the section Set up a static homepage.